Observation - Hellebore leaf mine - UK and Ireland. Description: Leaf mine of Phytomyza hellebori in Helleborus foetidus. Probably very unrecorded judging by NBN map. Mines very conspicuous in the winter. 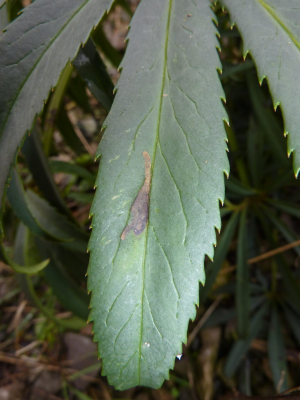 Leaf mine of Phytomyza hellebori in Helleborus foetidus. Probably very unrecorded judging by NBN map. Mines very conspicuous in the winter.